Monument of the Pope innocent VIII of the Cybo family; the most ancient papal monument in the present church, the work of the Pollajolo brother’s, the famous painters and sculptures. 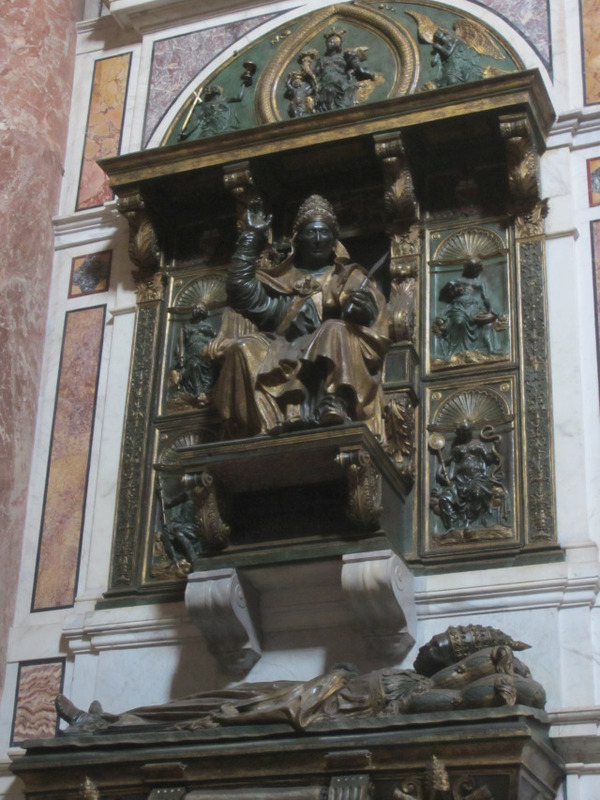 It is one of the three monuments of the popes removed here from the old basilica, the pope is at first represented on a throne as giving the benediction with one hand, while with the other he is holding the lance, given to him by the Sultan Baiazet II, said to be the same one which Longinus pierced the side of our Saviour and one of the important relics preserved in St. Peter’s. Lower down the pope is represented as reclining on the sarcophagus. Monument of Pope Pius X the good and holy pope who died broken hearted at the outbreak of the last war and who was proclaimed Saint. The remains of the Pope rest in the crypt, near the tomb of St. Peter. Official Rome Guide, Rome walking city Tours. The monument is the work of Astorri and Di Fausto. Chapel of the Presentation having above the high altar, a fine mosaic representing the Presentation in the Temple, a copy from an original by Romanelli now in St Mary of the Angels. Guide of Rome. Monument of Bendict XV under whose reign the first world war was fought. The pope is represented kneeling, in the act of devout prayers, as if imploring from Heaven the end of the terrible calamity. A bronze bas-reliefs in the backgrounds represents the disasters of the war, with cannons, carriages, burning ruins, etc. Above the pope is a beautiful figure of the Madonna holding the Infant Christ in her arms, who is dropping a branch of olive, symbol of peace, as a sign that the prayers of the pope have been heard. The monument is the work of the sculptor Canonica. Monument of Maria Clem. Sobiesky – Stuart wife of James III, who died in Rome in 1735: the inscription calls her Queen of England, France and Ireland. The monument, work of Filippo Barigioni and Pietro Bracci, is the last Barocco work in the church. Monument of the Stuarts erected to the three pretenders to English throne: James III, (died in Rome in 1766) and his sons Charles Edward and Henry IX cardinal and bishop of Frascati, better known under the name of Cardinal York. The monument is the work of the sculptor Canova. Baptistery. The upper part of the font made of gilded bronze was designed by Fontana in the year 1698. The lowest part made of red porphyry is supposed to have been the lid of the sarcophagus of the emperor Hadrian. On the walls around are three mosaics, the central one represent the Baptism of our Lord by Carlo Maratta. The one on the left, Peter Baptising the two jailers Processus and Martinianus in the Mamertine prisons. Opposite: Peter Baptising Cornelius the Roman centurion. We proceed to the visit of few monuments left in the right isle.